Dreams and reality: Will photo ops produce Mideast peace? 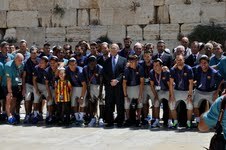 Photo Credit: Gilad Zamir, Courtesy of Israel Tourism Ministry / Description: FC Barcelona soccer team at the Western Wall in Jerusalem, Israel. At the Washington press conference held on July 30, US Secretary of State John Kerry declared that the Israelis and Palestinians will aim to reach a final status agreement to end their conflict in the time frame of nine months. He also had some words to say about the “dividends of peace” and the belief that the negotiators and leaders on both sides have in the success of the peace process. Fast forward a few days later, and the highly popular FC Barcelona is visiting Israel on a two-day “Peace Tour,” holding soccer clinics for 2,000 enthusiastic Israeli and Palestinian children in soccer stadiums in Tel Aviv and Hebron. It is unclear whether FC Barcelona was made aware of Asael Shabo’s story. When Shabo was nine-years-old, a Palestinian terrorist broke into his family’s home in the Itamar community and murdered his mother and three brothers in a brutal gun attack on June 20, 2002. Asael, who was watching TV together with his five-year-old brother, Avishai, was badly injured while his younger brother was killed in the attack. A sister, Aviya, was also injured. Following the terrorist attack, Shabo’s right leg had to be amputated and he spent two years in the hospital. He began intense rehabilitation treatments at the Israel Sports Center for the Disabled (ISCD) in Ramat Gan, where he later excelled in competitive sports. It is the generation of youth like Asael Shabo whose stories are often forgotten during waves of peace talks. Those children who lost mothers, fathers, and siblings in countless terror attacks that engulfed the Jewish state by Palestinian terrorists seeking only Israel’s destruction. But even more ironically, that element of terror and hatred still permeates Palestinian leadership. While many were celebrating the opportunity for Israelis and Palestinians to come together in light of FC Barcelona’s visit, there were those who felt very differently. Who are the dreamers and who are the realists? Ignoring Fatah officials and leaders like Jibril Rajoub do not make them go away. They may not appear in photo ops in Western media, but their hate speech and actions continue to propel another generation of Palestinians to play a very different game than that envisioned by Shimon Peres, John Kerry and the well-meaning FC Barcelona.